You don't have to like football to enjoy tailgating! What is more fun than sharing good food with good friends? 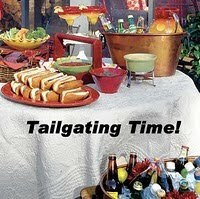 Join us for week #6 of Tailgating Time, it easy, just add your link! It's all about the food!! We make chicken tacos instead of beef all the time. I love the verde salsa with chicken. Use any cooked chicken and shred it as thin as you like. I use white corn tortillas and add a little oil to my omelette pan and fry the tortillas longer than you would for enchiladas and not as long as you would for tostadas. Cook them about 30 seconds on each side then place on a plate with a pepper towel and place another paper towel on top and fold it over, then on to the next one. I like it a little crisp, but not crunchy. Sprinkle on some parmesan cheese with a little garlic salt while they are still cooking so it will stick to the tortilla, they are so good like that. Then build your tacos the way you like them with cheese, lettuce, avocados, tomatoes and salsa verda. Remove the husks from tomatillos and rinse well. Place in sauce pan and cover with water and boil, then simmer for 5 minutes. Remove and let cool enough to handle. Place tomatillos, with remaining ingredients in food processor or blender and pulse until mixed and chopped well. If you like a thinner consistency add a little water. Cool in refrigerator (or cooler). Can serve with chips too perfect for the game. I bet chicken tacos are even better than beef. These sound delicious. Thanks for hosting and looking forward to seeing all the great recipes. They look great! I've never made chicken tacos and will have to try it. Thanks for the recipe and have a great day! Brenda, we like them better than beef, we also like shredded pork with the verde sauce. Pam, Thanks, tacos is a great way to use up some leftover chicken. I have yet to make fish tacos, but it's on my "to-make" list. I adore tacos and especially with a salsa with tomatillos! great recipe, Lyndsey. Lyndz, I just made some tomato salsa yesterday! Yes, my first attempt and am loving it. Your tacos look really tempting. I can use my tomato salsa on tacos as well! Hope you're having a wonderful day. Interesting way you make your shells...I deep fry mine...I have these taco tongs...they form the tortilla into a shell I found them at a restaurant supply..Your way seems less fussy...I'll try it. I hope I posted a comment...I tried. I have eaten beef tacos before...very delicious. I would love it with chicken. Yours looks very delicious. Thanks very much for sharing. I love chicken tacos! More than beef. These sound really good with tomatillos! Love chicken and beef tacos..looks so yummy!!! I love tacos and your tacos looks so beautiful especially on that plate. Yummy tailgating tacos Lyndsey! We love chicken tacos here too - leftover rotisserie chicken works great! tasteofbeirut - we do too! Kristy - yes tomato salsa works great on tacos too! Yumm! Bo - yes got your comment! I never thought to deep fry them, probably because I like them a little soft with a little crunch, and that way I can add the parmesan to the outside of the shell! Reeni - you should try them with the tomatillos! Anncoo - thanks, my aunt gave me those dishes...some of my vintageware I think from the 50s or 60s. Jay thank you so much! Martha, sorry to hear things are rough with your mother, wishing her well and thanks for taking the time to stop in.